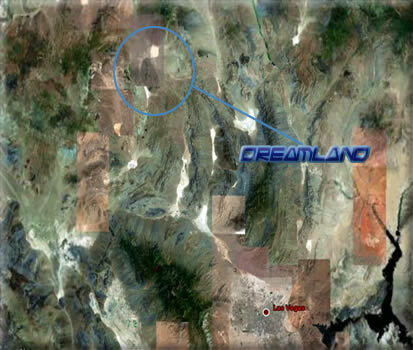 Dreamland is about 90 miles north-northwest of Las Vegas, Nevada, USA. Dreamland consisting of Area 51 and Groom Lake, as well as the site S-4 and Papoose Lake is about 20 square miles. This image was taken from an altitude of about 120 miles.